The E Factor concept has played a major role in focusing the attention of the chemical industry world-wide, and particularly the pharmaceutical industry, on the problem of waste generation in chemicals manufacture. It provided, and continues to provide, the impetus for developing cleaner, more sustainable processes. In the early 1980’s my attention was drawn to the problem of waste in the (fine) chemicals industry by the closure of a phloroglucinol plant at Océ Andeno . The plant was shut down because the cost of disposing of the waste was rapidly approaching the selling price of the product. The process generated ca. 40 kg of solid waste containing Cr2(SO4)3, NH4Cl, FeCl2 and KHSO4 for every kg of phloroglucinol. Based on a subsequent inventarisation of the amount of waste formed in processes for the manufacture of other fine chemicals and pharmaceutical intermediates and some bulk chemicals, it soon became clear that tens of kgs waste per kg product was no exception in the fine chemicals industry. 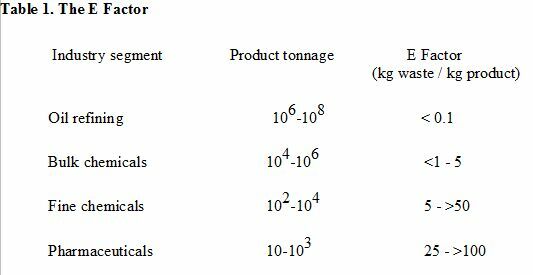 In the late 1980s I introduced what I called the E(nvironmental) Factor (kgs waste / kg product) for assessing the environmental impact of manufacturing processes . It is now generally accepted that two useful measures of the (potential) environmental acceptability of chemical processes are the E factor , defined as the mass ratio of waste to desired product and the atom efficiency . The atom efficiency or atom economy concept is an extremely useful tool for rapid evaluation of the amounts of waste that will be generated by alternative processes. It is calculated by dividing the molecular weight of the product by the sum total of the molecular weights of all substances formed in the stoichiometric equation for the reaction involved. The E factor, in contrast, is the actual amount of waste produced in the process, defined as everything but the desired product. It takes the chemical yield into account and includes reagents, solvents losses, all process aids and, in principle, even fuel (although this is often difficult to quantify). There is one exception: I generally excluded water from the calculation of the E factor. For example, when considering an aqueous waste stream only the inorganic salts and organic compounds contained in the water are counted; the water itself is excluded. Inclusion of water used in the process can lead to exceptionally high E factors in many cases and can make meaningful comparisons of processes difficult. The enormity of the waste problem in chemicals manufacture is readily apparent from a consideration of typical E factors in various segments of the chemical industry. A higher E factor means more waste and, consequently, greater negative environmental impact. The ideal E factor is zero. Put quite simply, it is kilograms (of raw materials) in, minus kilograms of desired product, divided by kilograms of product out. It can be easily calculated from a knowledge of the number of tons of raw materials purchased and the number of tons of product sold, for a particular product or a production site or even a whole company. Other metrics have been proposed for measuring the environmental acceptability of processes, such as process mass intensity (PMI), defined as the total mass used in a process divided by the mass of product, i.e. PMI = E factor + 1. In my opinion none of these alternative metrics offers any particular advantage over the E factor for giving a mental picture of how wasteful a process is. The ideal PMI is 1 whereas the ideal E Factor is 0, which more clearly reflects the ultimate goal of zero waste. One of the reasons that the E factor increases dramatically on going downstream from bulk to fine chemicals and pharmaceuticals is that the latter involve multi-step syntheses and pharmaceutical companies have emphasized that the absolute amount of waste is lower than in bulk chemicals because of the much lower production volumes involved. However, the larger E Factors in the fine chemical and pharmaceutical industries are also due to the widespread use of classical stoichiometric reagents rather than catalysts (see later). A paradigm shift was necessary to change from the traditional concepts of process efficiency and optimisation that exclusively focus on chemical yield of the desired product to one that assigns economic value to eliminating waste and avoiding the use of toxic and/or hazardous chemicals. The E factor takes only the mass of waste generated into account. However, what is important is the environmental impact of this waste, not just its amount, i.e. the nature of the waste must be considered. One kg of sodium chloride is obviously not equivalent to one kg of a chromium salt. Hence, I introduced the term ‘environmental quotient’, EQ, obtained by multiplying the E factor with an arbitrarily assigned unfriendliness quotient, Q. For example, one could arbitrarily assign a Q value of 1 to NaCl and, say, 100-1000 to a heavy metal salt, such as chromium, depending on its toxicity, ease of recycling, etc. The magnitude of Q is obviously debatable and difficult to quantify but, importantly, ‘quantitative assessment’ of the environmental impact of chemical processes is, in principle, possible. It is also worth noting that Q for a particular substance can be both volume-dependent and influenced by the location of the production facilities. 2. 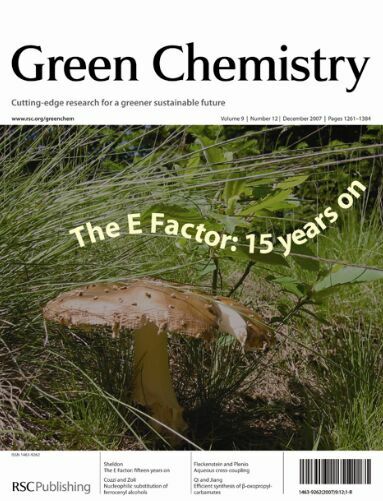 R.A. Sheldon, “The E factor: fifteen years on”, Green Chem. 9 (2007) 1273-1283. 3. R. A. Sheldon, “E factors, green chemistry and catalysis: An odyssey”, Chem. Commun. (2008) 3352-3365. 4. S. K. Ritter, “Calling all chemists” C&E. News, Aug. 18, 2008, pp.59-68. 5. A. N. Thayer, “Centering on chirality”, C&E. News, August 6, 2007, pp. 11-19. 7. R.A. Sheldon, I. Arends and U. Hanefeld, “Green Chemistry and Catalysis”,Wiley-VCH, Weinheim, 2007.